Dimensions 448' by 58' by 23'4"
The Wright was built in 1920 and almost immediately converted by the Navy for use as an airship tender (AZ.) By the start of the Pacific War, rigid airships were much less important in Navy planning and the ship had been converted to a seaplane tender (AV.) 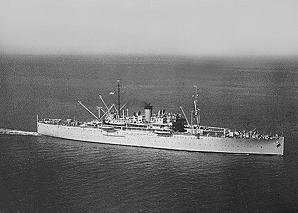 When war broke out, she was northwest of Kauai en route to Midway.